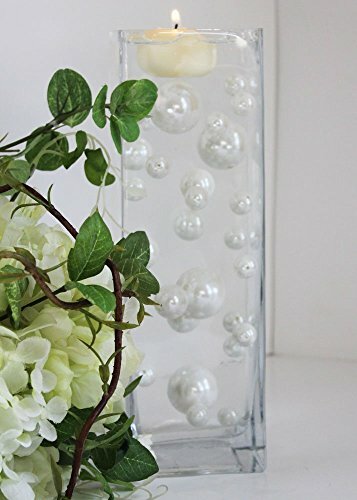 Pearls beads that appear to be floating inside the vase are a hot new trend! We are including the clear JellyBeadZ® gel FREE with your order! You will receive 4 Jumbo, 6 large, 12 medium and 12 small pearl beads AND the FREE JellyBeadZ®. All you need to do is add water and you have your centerpiece. Instructions are included so you can make your centerpiece with ease. You can add a candle, flowers or any decoration of your choice. Or you can leave it as is. It's gorgeous all on its own! We have many colors available -black, white, ivory, red and purple, and more. Ask us about all of one color of a custom mix. You will receive 4 Jumbo, 6 large, 12 medium and 12 small pearl beads AND the FREE JellyBeadZ®. We include easy to follow instructions so you can make your centerpiece with ease. Professional centerpieces at half the price....YOU are the "designer" !!! You must have the transparent water gel to get that floating pearl look. We send you the JellyBeadZ® FREE, no need to make another purchase. If you have any questions about this product by JELLY BEADZ, contact us by completing and submitting the form below. If you are looking for a specif part number, please include it with your message.